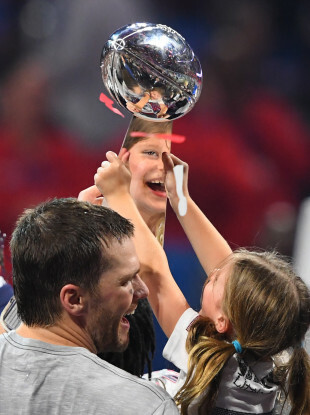 Tom Brady holds up the Vince Lombardi trophy with his daughter Vivian. THERE ARE MANY native American myths about how the sun came into being. Some talk of rabbits needing light to guide the way, others of ravens transforming into humans and back again. But they all have the same central theme; once upon a time there was no sun. Then it came into being for the benefit of all life on earth. There will, however, come a day when the universe is dark and cold again, when the last star is extinguished and life as we know it ends. And the heat death of the universe is arguably one of the very few things less enjoyable than Super Bowl LIII. If you did happen to enjoy last night’s game, I can assume you fall into one of three categories. If this is the case, then that’s perfectly acceptable. This actually might be the Bill Belichick masterpiece; his Sistine Chapel of Super Bowl wins. Each of the Patriots’ Vince Lombardi trophies have come about in different ways, but never has Belichick — with defensive play caller Brian Flores — so utterly dominated a coaching match-up. There will be a few NFL front offices waking up this morning wondering what they’ve done in hiring everyone in Sean McVay’s phonebook, and his reputation as one of the finest young offensive coaches in the game may take a hit with the 13-3 scoreline. That he was out-coached is an understatement. Despite Belichick’s team excelling in man coverage all year, the Patriots defence copied the Lions’ model from December and showed way more zone looks than McVay and his quarterback seemed prepared for. Belichick dared Jared Goff to win the game for the Rams and his return was 19 of 38 for 229 yards and what would eventually prove to be the game-deciding pick. There was a series in the second quarter that sums up the entire game. The Patriots had just scored the first points of the Super Bowl, but the Rams had a chance to answer with the ball at their own 27-yard line. First CJ Anderson ran for five yards, then Goff connected with Robert Woods on an 18-yard pass and it looked like the Rams offence was finally rolling. Cooks caught a short pass on the next play and, with second and seven in the Patriots’ half, many LA fans were probably thinking they could at least tie the game with a field goal. However, on second down, back-up lineman Danny Shelton — who wasn’t even kitted for the Patriots’ AFC championship win over the Chiefs — sliced through the much-vaunted Rams offensive line and tackled Anderson for a three-yard loss. On third and 10, Belichick knew that the Rams would have to throw the ball, and so he dialled up the pressure on Goff, forcing him to throw off his back foot and giving Jason McCourty a chance to stop Josh Reynolds from making the completion. All told, 27 of the Rams’ 60 plays went for zero or negative yards. If you can’t run, and you can’t complete passes, it’s very unlikely you’re going to win a football game. Special teams is an important part of the game. You don’t have to like it, but it is. Johnny Hekker finished the game with nine punts — opening the game with eight in succession — for 417 yards, and his 65-yard effort set the record for the longest punt in Super Bowl history. Patriots’ punter Ryan Allen punted five times for 215 yards one year after he famously didn’t touch the ball in their loss to Philadelphia. Crucially, however, Allen made sure the Rams started drives inside their 7-yard on three of his five punts and genuinely should have been in consideration for Super Bowl MVP. Of course, Hekker and Allen have history, with the pair battling it out for the job as starting punter with Oregon State in 2008. And while Hekker may be the superstar punter — if such a thing exists — Allen is the one with three Super Bowl rings. After watching that half-time show, maybe the heat death of the universe can’t come soon enough? Tom Brady’s case for being the greatest of all time wasn’t helped or hindered by last night’s performance. Pretty much all anyone will remember in a decade’s time is that it was his sixth ring. It was, however, the first Super Bowl of his career in which he did not throw a touchdown. Considering he threw for over 500 yards last year and came away empty-handed, I’d imagine he’s happy enough with the outcome, regardless of his statline. And while he was definitely poor at times on Sunday, he came up big when it really mattered, reeling off four passes in a row for 67 yards with 10 minutes remaining to set-up the game-winning touchdown. The Brady to Gronk connection struck again for the Touchdown drive! It should also be noted that the actual Super Bowl MVP, Julian Edelman, served a drugs ban to start the year and, in any other sport, would have sat out more than just four games. If that situation opens up a real discussion about the NFL’s inconsistent approach to drugs — where smoking weed can get you banned for life — then all the better. However, despite Edelman controversy, the punting, and the Spongebob-themed half-time show, when we look back at Super Bowl LIII in years to come, it’s Bill Belichick’s coaching we’ll remember. The 2018 NFL season featured the second-most points per game, the second-most yards per game, and the most first downs per game. The final four teams were the top-four on offence for the first time. “I’m almost numb … They did great job, but it was mostly result of me doing a poor job calling plays and not giving us a chance to win. Email “Hardly super, but the Patriots remind us why all three phases count in the NFL”. Feedback on “Hardly super, but the Patriots remind us why all three phases count in the NFL”.